My Cup Of Tea presents to you - a range of health and wellness based teas to suit your taste buds. These blends are 100% natural and preservative free and are guaranteed to make you feel healthier and happier. We hope to help you take a step forward towards your health and fitness! 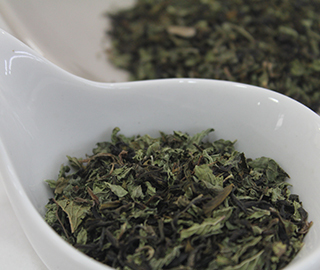 Mint-To-Cure is a refreshing and cool blend of green tea, basil and peppermint. While basil is a herb packed with antioxidants and anti ageing properties, peppermint helps in getting rid of insomnia, nausea and headaches. 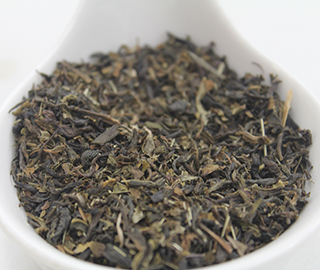 This beautiful blend of tea also aids in weight loss and controlling diabetes. Packed in 100 gram caddies, this tea is sure to make you smile! The Tea Fairy is a sweet mint tea born out of an ancient Moroccan tradition of blending and brewing green tea with mint and sweetening it with sugar. This relaxing and refreshing blend can be enjoyed hot or iced! While green tea has it’s own health benefits, chamomile, peppermint and spearmint serve as a cherry on the cake. This crisp and cooling brew helps in curing fevers, relieving stress, improving the condition of oily skin and it also aids in weight loss! Available in 100 gram tea caddies, this invigorating tea is guaranteed to make your day! 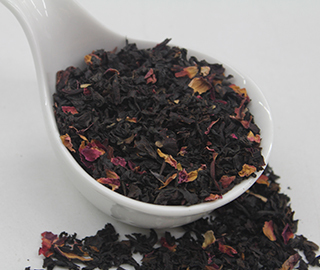 Nature’s Bounty is a sweet and aromatic blend of black tea, sweet rose and tangy, punchy hibiscus flowers. This tea can be savoured hot or iced. While the Hibiscus flower works its wonders curing hypertension,high blood pressure and high cholesterol,Black Tea helps in blood sugar control,Rose helps in acquiring clear skin and relieving stress and depression. Available in 100 gram caddies this rejuvenating tea is guaranteed to make you feel better. Mr. Lounge is a calming blend of black tea, orange peel, lavender and pineapple. Savour the sweet and citrusy flavours of pineapple and orange while enjoying the intoxicating aroma of lavender. This tea is packed with a healthy dose of vitamin C which is a great immune system booster and can help in fighting the symptoms of cold and flu. This blend is also rich in nutrients and minerals all set to cure infections and allergies. Packed in 100 gram caddies, this tea is guaranteed to make you feel rejuvenated. The Tangy Indian is the classic indian masala chai, but with a twist. 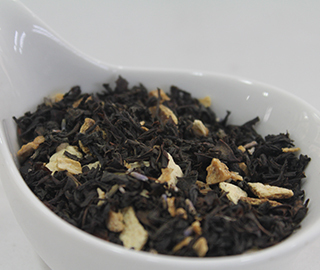 It is a flavourful blend of black tea, clove, cinnamon and ginger with a hint of orange. This flavour is best enjoyed with milk and enhanced with some sugar or a drop of honey. Rich in wholesome spices, this tea helps combating nausea, acidity, bloating, constipation and loss of appetite. 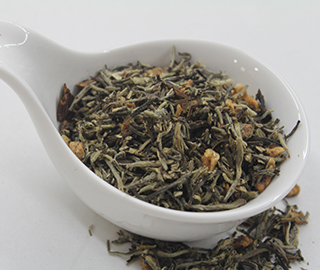 Packed in 100 gram caddies, this tea is sure to leave you wanting for more! Sweet Endings is your go-to blend of tea. It is a perfect, healthy substitute for your favourite dessert in a cup! It includes a magical combination of white tea paired with vanilla, apple and cinnamon. While white tea, apple and vanilla are filled with antioxidants and antiflammants, cinnamon treats muscle spasms, nausea and diarrhoea amongst many other health benefits. Packed in 100 gram caddies, this tea is guaranteed to keep you healthy and fit. 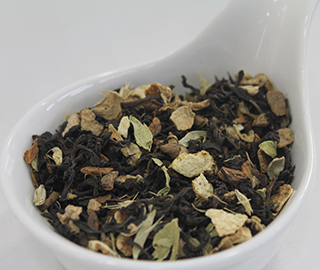 From Granny, with Love is a calming blend of green tea, spearmint, ginger and cinnamon. This relaxing tea is guaranteed to remind you of the care and warmth of your sweet Grandma! While curing nausea, cough, cold and allergies, this tea also aids in weight loss and digestion. Packed in 100 gram caddies, this tea is sure to make you feel loved. 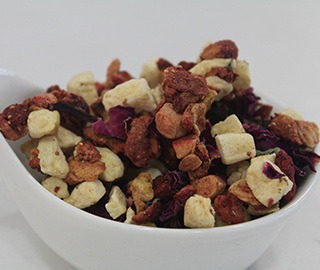 Lucy in the Sky is a refreshing blend of strawberry, rose, rose hip, hibiscus, apple and spearmint. While strawberry and rose hip are nutrient rich and packed with antioxidants, hibiscus helps in curing hypertension, high blood pressure and high cholesterol. Rose helps in acquiring a clear skin and spearmint gives a cool and relaxing effect. Packed in 100 gram caddies, this tea-free blend is sure to make you feel rejuvenated. 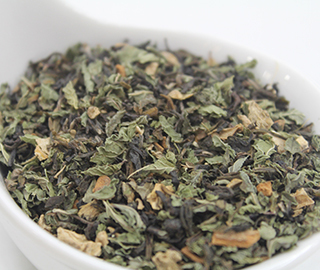 Mother Earth is a rejuvenating blend of green tea, tulsi and lemongrass. Rich in anitoxidants, this tea helps in treating digestive disorders, stomach ache, high blood pressure, fever, cold and flu. Packed in 100 gram caddies, this morning tea is guaranteed to keep you energised throughout the day. 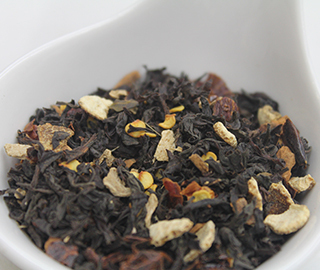 Chilli Chai is a hot blend of black tea, ginger, cinnamon and orange peel paired with a hint of chilli flakes. While orange peel is packed with Vitamin C that serves as an immune system booster, black tea helps in blood sugar control, cinnamon helps in curing cough, cold, flu and allergies and ginger helps in treating nausea and motion sickness. 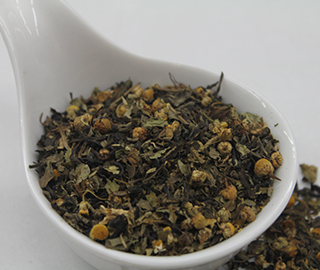 Packed in 100 gram caddies, this tea is sure to make you feel warm and cosy !